Last time we’ve talked about Travel in style with GCash indicating how convenient it is to have GCash to get or pay your daily transactions, activities and business. We’ve also shown how to avail of the GCash service. We’re no expert in investing  however talking something about savings and earnings is a daily hall way conversation. One good feature of GCash that is just recently rolled up to subscribers is the Investment section. Another good feature we’ve like about GCash investment is the transfer to your investment account. It is easy as 1-2-3 or just a click by hand. In the main menu, select “show more” then “invest money”.. from here, you’ll see your investment profile and your investment. To invest, select “view investment product”. 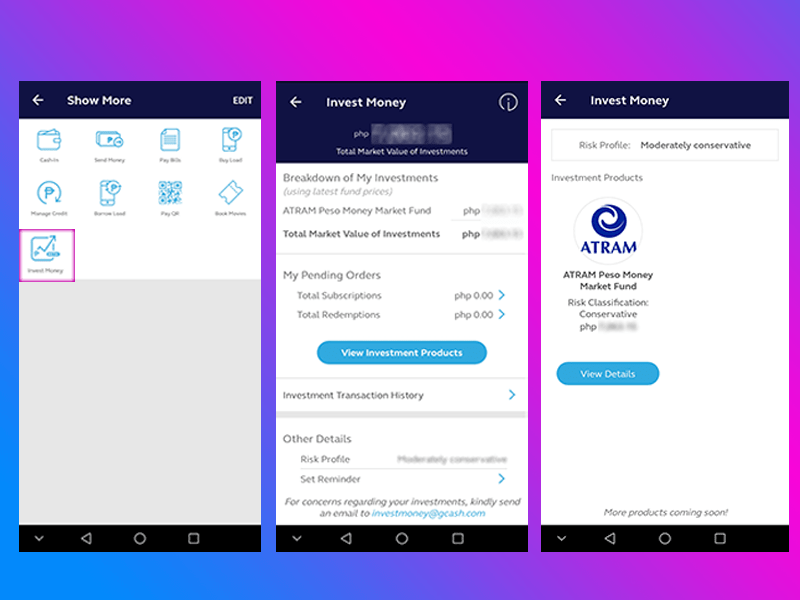 For now, it is only Atram as an option where you can invest your money as little as 50 pesos, yes! 50 pesos and you can add at anytime later if you have extra. You need to enroll and get approve by Atram first before you can start investing. Enrollment procedure is built into the GCash app and there’s a questionnaire first of a type of an investor you are, eg. aggressive investor, short/long term preferences, etc. It will be processed and you’ll receive approval or decline message after few days. As notifications rolled out earlier, GCash is partnering more with providers. There will be more beside Atram in the near future. There would be criteria for the partnership so you will be a bit confident about your money and into GCash, but of course, this is a new, so we would not perhaps pour big amounts into it until proven good after a year or two from now. Unlike banks that gives you yield in a year? In a quarter? In a month? In GCash, you can check everyday and you’ll see few cents are added to your investment. We will try to answer your questions as end users/subscribers perspective, if you have one, kindly comment below. Oh, by the way if you have decided to avail GCash, just goto our previous blog article how to get GCash and remember to enter referral code AWO6CT, thank you!